Drugi podatki TRK's Single Pin Quick Coupler is a traditional manual quick coupler where the operator is required to pull one pin out to change the attachment. However, because the grab hooks are holding the attachment in alignment, installing the pin is easy. Locks on to dedicated pin centres (required). Na Mascus.si lahko najdete stroje znamke [Other] TRK EXTREME SINGLE PIN COUPLER (Couplers) iz kategorije hitre spojke. 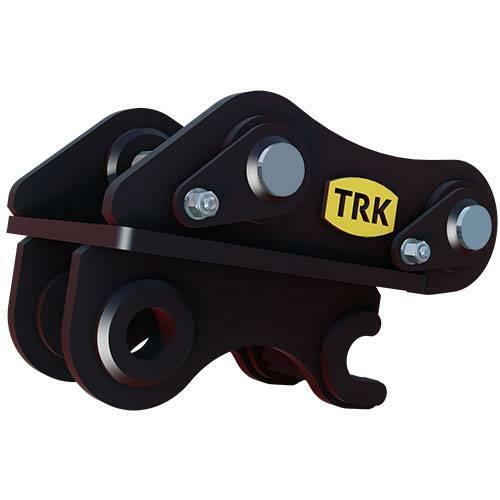 Cena tega [Other] TRK EXTREME SINGLE PIN COUPLER (Couplers) stroja je -, registriran je bil leta 2019. Ta stroj se nahaja v - Kanada. Na Mascus.si lahko najdete številne druge stroje znamke [Other] TRK EXTREME SINGLE PIN COUPLER (Couplers) ter seveda druge stroje iz kategorije hitre spojke.